Why not try creating a particle effect using lightweight actors (or images) and along the way, compare its performance to doing this with regular actors? To create particle effects, just spawn actors rapidly and “emit” them at a random speed and starting position and have them fade out over time. With some experimentation, you can create a fire and smoke effect with ease. Many games have a mechanic that allows you to fire bullets, but only a certain number at a time, otherwise the game would become too easy. Why not try creating a bullet limiter that allows the player to create no more than 3 bullets at once? 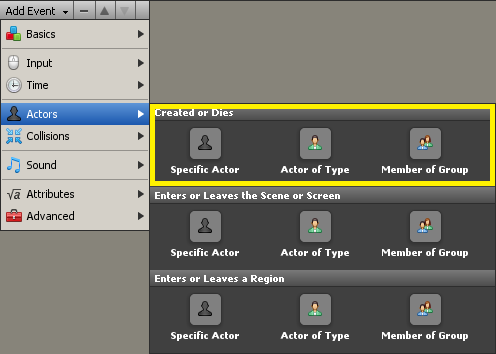 Hint: Use the ‘when an actor of [TYPE] is created/killed’ event. Is there a way to flush the pool of recycled actors? I don't really perceive a frame rate difference between the recycled actor mode and the normal actor mode in the particle demo. I recreated the demo on my machine and also see no substantial difference in performance in my version. I am generating 12 particles per click and fading them out over 4 seconds; in both the recycle and normal modes the frame rate drops off quickly once you go over ~160 particles. Acsmitte- The Germans lost because they had Hitler as their boss so there was no good strategy- if they had gone straight for the oil supplies in Urals mainly then the Russian war machine would have ground to a halt. Its like a vast war game that you explore without any point- your forces no matter how good assuming they are mortal if spread thinly will always lose. Its like playing Hercules in standard battlefield rather than guerilla like Rambo. Acsmitte's comment got negative votes. I gave it a positive vote. It showed interest in history AND it sounds like he had a War Game on his mind. I believe it works thusly. Creating an actor consumes a larger portion of resources than just having one, same for destroying. So if you are constantly creating/destroying, thats a lot of resources. But, if you create once (with a recycled actor) and then just reuse the same actor over and over, it uses far fewer resources constantly existing than constantly being created/destroyed. But, if you had a fairly complex actor, with many constant events/behaviors that uses a lot of resources while existing, recycling it would mean those resources keep being used even when the actor isn't. That's what I think the difference is. i have no idea what is the difference between recylced and created. i mean article needs an example which says in this case creating actor bad thing, recycling actor good thing. is it only about game performance? Recycling things is usually good. However it requires you to have those created, even when they are not used, which allocates memory. So don't recycle more things than necessary.